Office administrators wear many different hats. 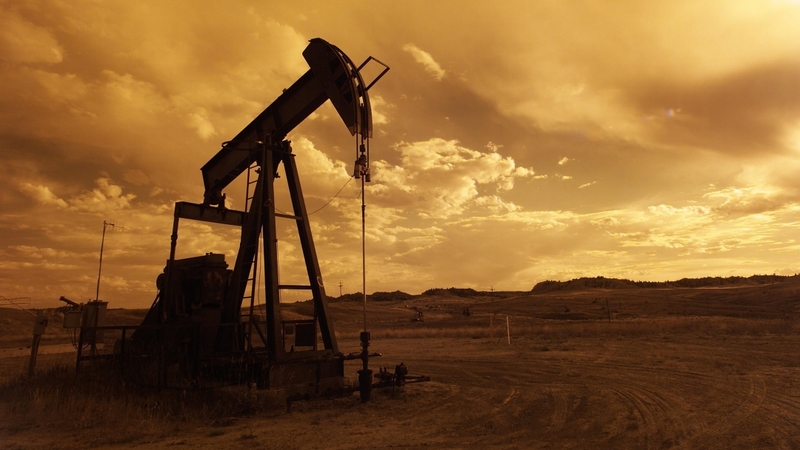 They’re responsible for collecting timesheets from members in the field. They process client invoices and reports from team members. In many cases they’re responsible for every document that comes through an office. 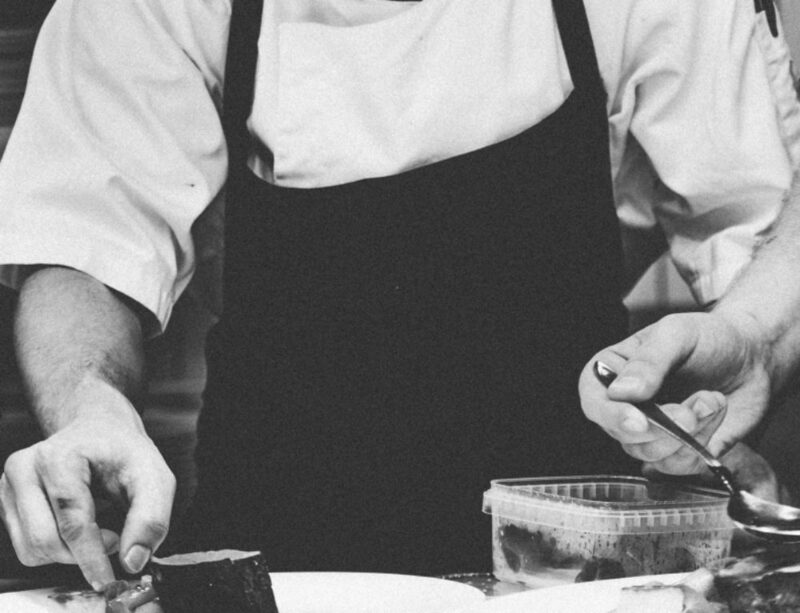 Traditionally, these tasks have been handled with a time-consuming paper system, but as technology sweeps through every industry, it only makes sense to use software to improve administrative processes. 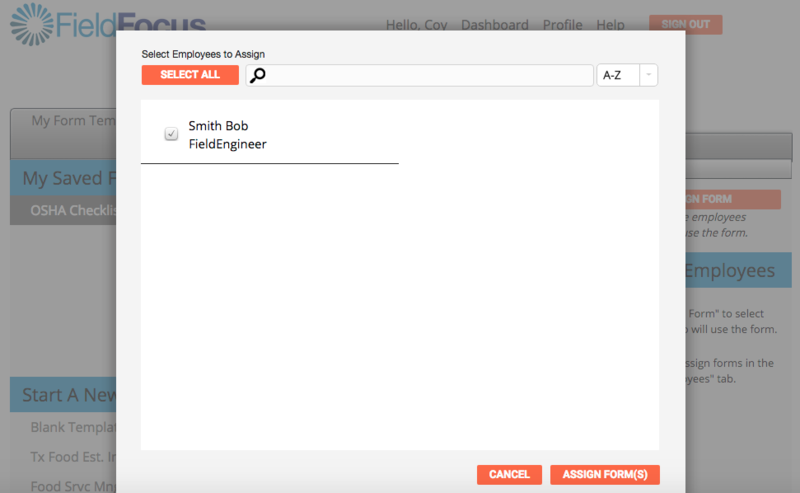 Office admins can use FieldFocus on their desktop computers to create custom forms – timesheets, inspection reports, checklists, etc – and then assign them to team members in the field. A one-page company report takes only 5-10 minutes to create from scratch, and then it’s hands off – everything is stored online. After the field staff submits their reports, office admins can store them, use them for management reporting, or email them to clients. What used to take hours with a pen and paper now takes just minutes. 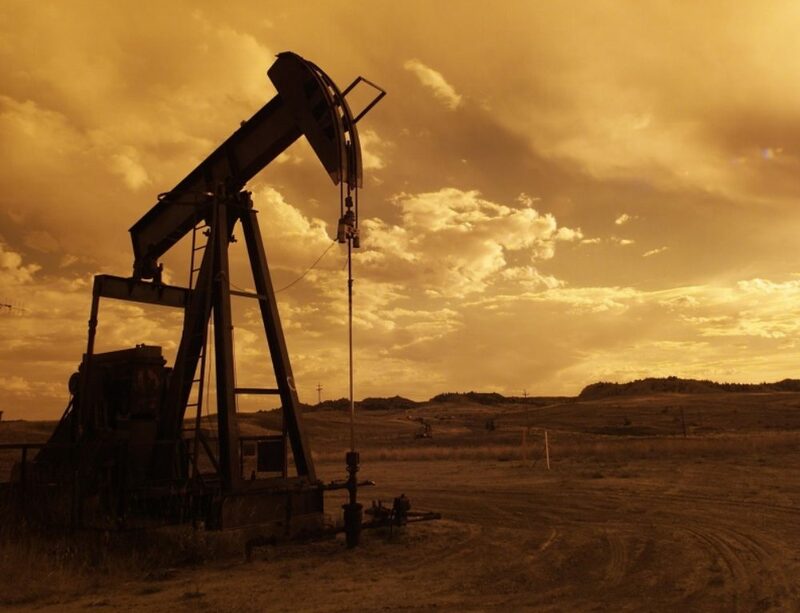 By providing real-time data collection and instant report submission, FieldFocus helps field workers and admins in every industry reclaim valuable time. 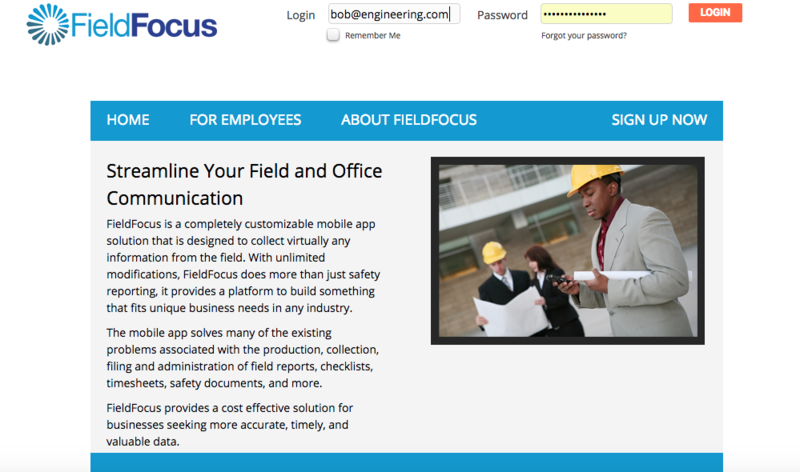 Visit app.fieldfocus.com and enter login details. 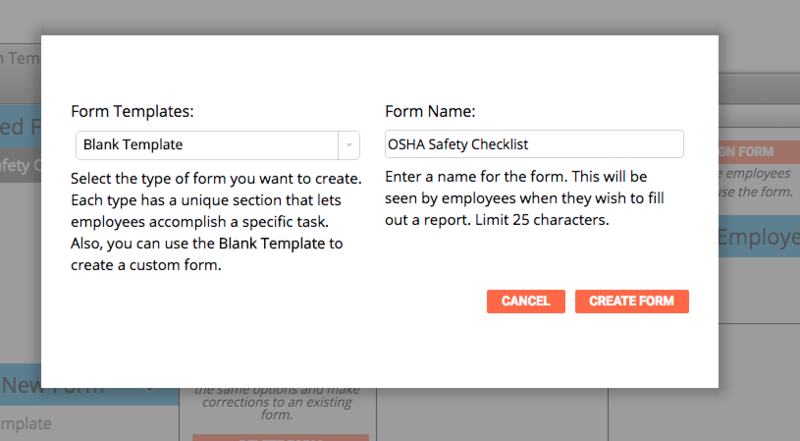 View dashboard and click “CREATE NEW FORM” in the orange box in the Form Options column. 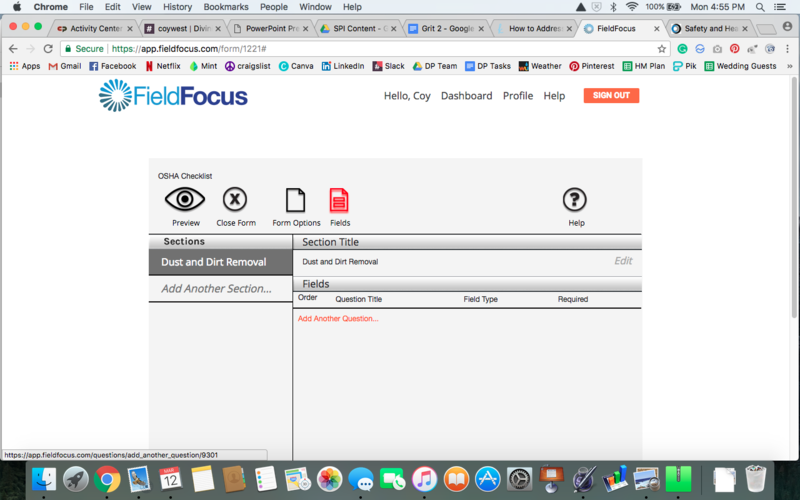 Now we’re on the question-building page for the new form. 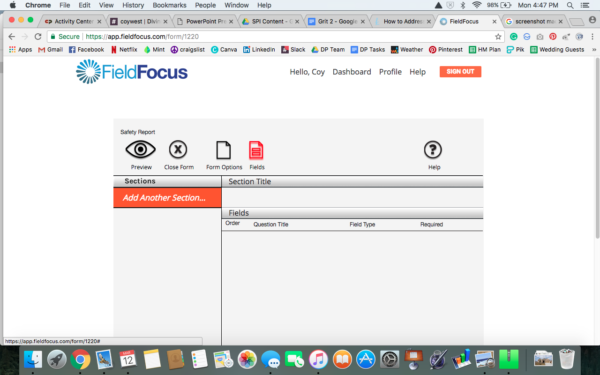 Click Add Another Section from the left-hand column to add a section to the form. A box will pop open to fill in details about the new section. 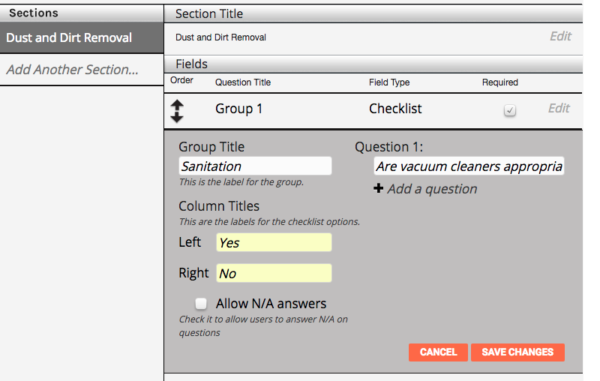 In this example, we’re creating a Dust and Dirt Removal section. With the new section added, it’s time to start adding questions to the section. With the newly created Section selected in the left-hand column, click the orange “Add Another Question…” text in the center field. After you’ve added all the form sections and questions, click Preview to see how the new form will look on a mobile device. 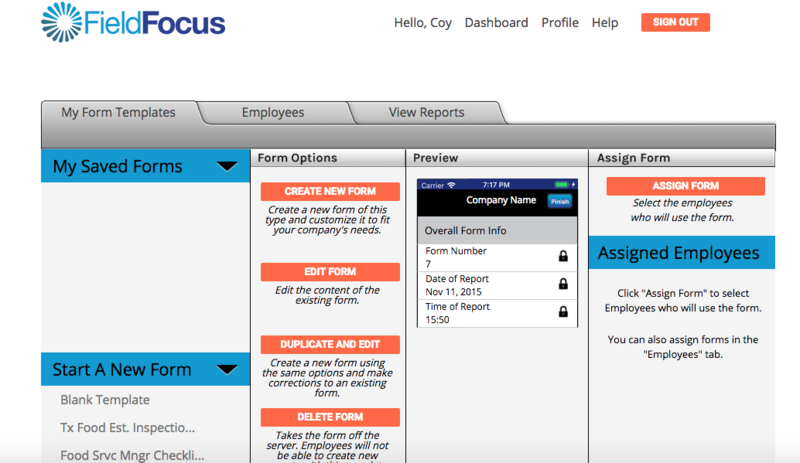 With the new form selected in grey, you can now assign the form to employees. Click the orange box on the right side with “Assign Form.” A box will pop open with your employees. Find the employee and click the circle to the left of their name and then click “ASSIGN FORM(S)” at the bottom. Back on the main dashboard, you can confirm that the employees were assigned the correct form. 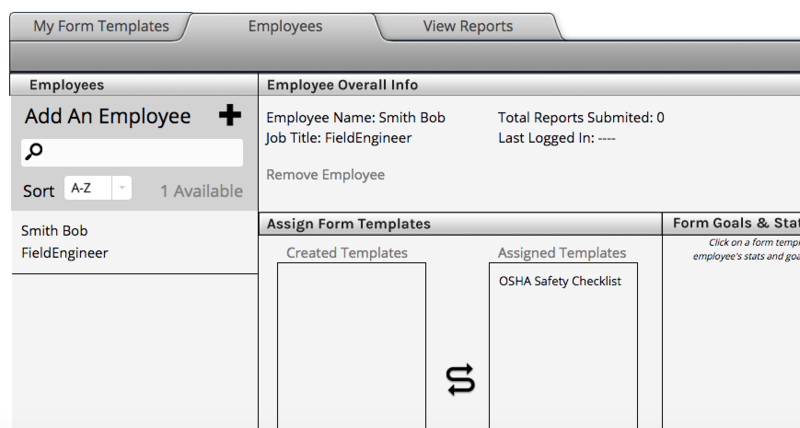 In the example below, you’ll see that “Bob Smith” was assigned the OSHA Checklist and it shows up next to his name. That’s it! 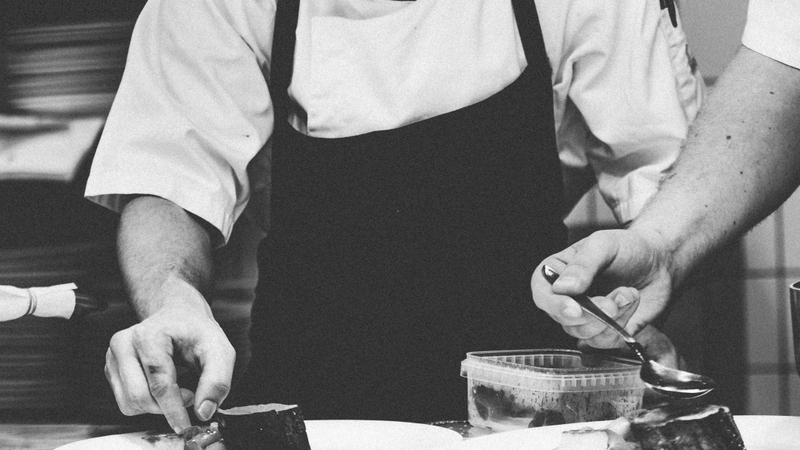 You’ve created your first form and assigned it to your team member. 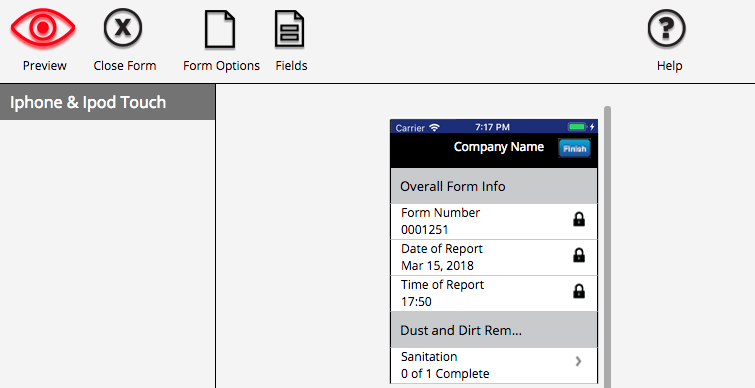 You can now use Form Options on the main dashboard to View, Duplicate and Edit or Delete your Saved Forms. 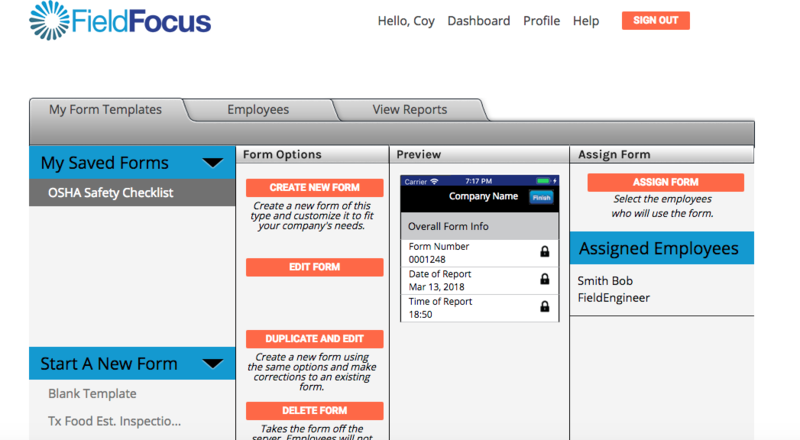 Are you ready to start creating custom forms? Or, are you already a FieldFocus user and have a question? Either way, give us a call today and we’d be happy to help you.